I’ve never been an enthusiastic participant in pop culture. So when the Twilight rage hit, I was unmoved. A friend tried to persuade me to borrow her book. “Carol,” she promised, “after you’ve read Twilight I guarantee that you will want you very own vampire.” I perfected my noncommittal hmmmm. No. That’s wrong. I laughed “I’m having difficulty even imagining that!” So why did I read a Twilight book? Because it was Morris Berman’s The Twilight of American Culture . 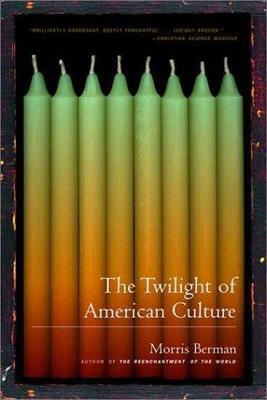 Published in 2000, this book describes what he calls a cultural massacre. Berman’s antidote is a way of cultural preservation he calls “the monastic option”. Stick with me. The idea isn’t to become a monk, but to act like the monks by holding tight to the treasures and exposing the emptiness of the corporate/commercial, prefabricated way of life. Berman outlines four factors that are present when a civilization collapses. 2. Declining success of organizational solutions to socioeconomic problems. 3. Rapidly dropping levels of literacy, critical understanding and general intellectual awareness. 4. Spiritual death–the emptying out of cultural content and the freezing (or repackaging) of it in formulas–kitsch, in short. Balzac on the pecuniary squeeze. In a culture of chaff, here is wheat. I was put off by Berman’s focal point of the Enlightenment as the locus for cultural renewal. While he admires the preservation of culture found in medieval monasteries, he completely misses the fact that their work was a form of worship. This entry was posted in Uncategorized and tagged bookreview, culturewatch by alivingpencil. Bookmark the permalink. You got me with your title–the thought of Carol Bakker reading a Twilight book!!! But the content of this post was excellent, and I agree completely. I have a little stuffed folk art star which I hung above my bed that says, “Simplify,” and I’m inspired to work on this in many ways, one being to go back to basic values and not be drawn in by the flashy things in this life. Thanks. Fooled me, too, Carol! This book sounds interesting. Our discussion at RCIA class last night turned to the coarsening of the culture. I like the idea of becoming a “monk” in the midst of it. I think you are a *Milton among us* – a la Wordworth’s lament Milton! thou shouldst be living at this hour:England hath need of thee: she is a fenOf stagnant waters: altar, sword, and pen,Fireside, the heroic wealth of hall and bower,Have forfeited their ancient English dowerOf inward happiness. We are selfish men;Oh! raise us up, return to us again;And give us manners, virtue, freedom, power.Thy soul was like a star, and dwelt apart:Thou hadst a voice whose sound was like the sea:Pure as the naked heavens, majestic, free,So didst thou travel on life’s common way,In cheerful godliness; and yet thy heartThe lowliest duties on herself did lay.Blessings on you and yours, especiallly the new Ethan Gregory! Your title scared me too. =) But I loved your book review and the quotes. And your insights.I like the “Great Books as a way of life” idea. Sounds like something I recently read by Anne Fadiman. Since I can’t find the book at the moment I’ll probably comment on it on my Friday blog post. People like you (and me) are becoming anachronisms. A couple of years ago I had a conversation with an author who, like me, writes YA fantasy novels. Unlike me, he is very successful. And I voiced my concern that the current faddish rules for writing will make our young people incapable of enjoying the masterpieces of the past. The focus for writers today is to show everything through action and jump from scene to scene quickly so that it’s the equivalent, for the reader, of watching a fast-paced movie. How can a kid raised on those books ever develop the attention span to mine the depths of Les Miserables or Homer’s Odyssey? When I posed this question to my author acquaintance, he shrugged. “Well, all those old classics are boring, anyway,” he said. “Who cares if kids stop reading them? They’re better forgotten.” Yikes! MamaMentor: I can’t imagine our life without those “boring”, slow books!However, I am finding that passing on that non-rushed, you need to engage time and thought kind-of-reading to my younger two kids is not very easy. With the older kids we read aloud many books and I think that made a difference. It is hard to slow down. Reading your title started ME rethinking my stand on Pop Culture! What a relief to have read the rest of your second paragraph! LOLI am absolutely going to read this book! This sounds excellent! I just checked the online catalog for our library and discovered that they do not have it. I’m wondering if this is further proof of the book’s thesis. Thanks for this review. This is definitely going on my must-read list! I read this book this summer. It made me think, but like you, I thought that the author’s promotion of the Enlightenment as the pinnacle of Western rhought was dead wrong. My family has been living the type of monastery existence Berman advocates for a long time, so it was exciting and affirming to see these ideas in print. I thought your review was bang on.